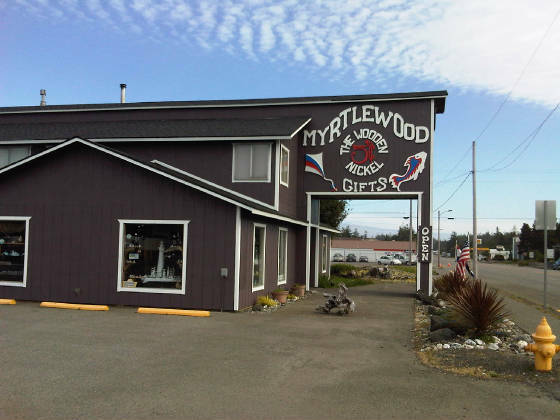 Located on the south coast of Oregon in beautiful Port Orford, home of the myrtlewood tree. the Wooden Nickel has been in continuous operation for over 38 years. Shop securely on-line at our newly remodeled store or if you're in our neck of the woods stop in and see our gift shop. While you're there take a tour and see how these marvelous handmade gifts are crafted. We offer quality crafted products in Myrtlewood, Maple, Redwood,and Port Orford Cedar, along with wax, satin, and gloss finishes. We pride ourselves on providing customers with the best-quality products and personal service. Our products are available wholesale to qualified retailers. To see all of our quality handmade products click the shop online link and enjoy.